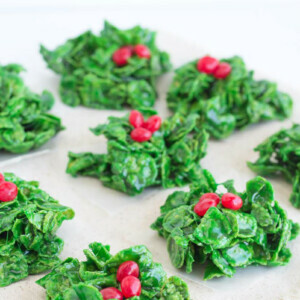 These super simple Holly Cookies are a great addition to holiday baking! In a large pot, melt the butter and marshmallows over medium heat, stirring constantly. Add the vanilla and food coloring. Stir in the corn flakes. Grease a spoon and drop spoonfuls of the mixture onto a greased cookie sheet, or vegetable oil sprayed wax paper. Place 3 red cinnamon candies on each bunch of "holly," pressing slightly so they stick. Let sit until they have cooled and set. To make these gluten-free, just be sure to use brands of marshmallows and corn flakes that are known to be GF.